Lafayette Square and Gallier Hall lit up for LUNA Fête, 2017. 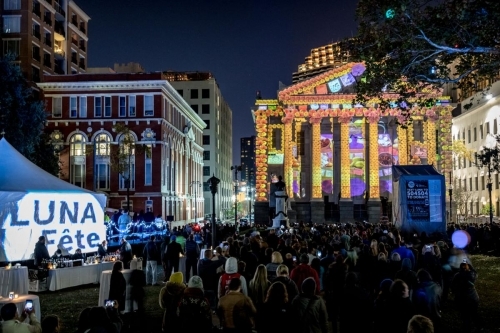 The Piazza d'Italia and the New Orleans Jazz Museum are the newest locations that will light up for LUNA Fête, a free holiday festival of art and technology that returns Dec. 6-9 for its fifth year. Gallier Hall and Lafayette Square will return to the colorful spotlight, making four places where New Orleanians can immerse themselves in radiance and interactive art installations, all set to music. 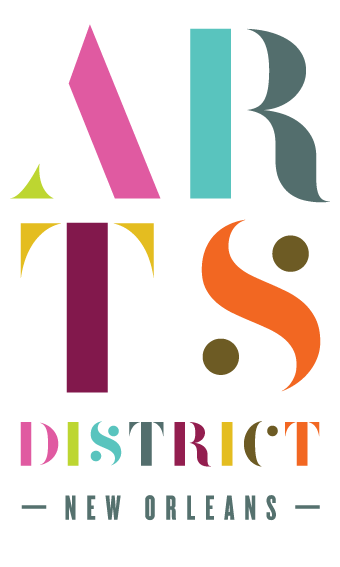 The event is produced by the Arts Council of New Orleans and presented by the city. This year's festivities were announced at a news conference Tuesday at Gallier Hall. LUNA Fête is the country's longest-running annual large-scale festival of projection mapping, which turns objects into a display surface for video projection. Local landmarks will be illuminated from 6 p.m. to 10 p.m., with the theme “Through Time,” to celebrate the city’s tricentennial. As in previous incarnations, Gallier Hall and Lafayette Square will be the epicenter of activity over four nights. The façade of Gallier Hall will feature a retrospective of LUNA Fête commissions by La Maison Production from France ("New Orleans") and AVA from Mexico ("Viva Nola! "), each of which will be followed with projection mapping by current students and alumni of New Orleans Center for Creative Arts. In Lafayette Square and along Lafayette Street, Laser Spectacles supported by the Azby Fund will produce a laser show illuminating the night sky, and art installations will be placed throughout. “Ninety-five percent of new artist commissions are local this year,” said Arts Council of New Orleans’ Executive Director Heidi Schmalbach. A LUNA Lounge will be available for VIP ticket holders ($50) with a special light installation, seating, heat, restrooms and craft cocktails provided by LeBlanc + Smith. The postmodern facade of Piazza d’Italia will feature a projection-mapped “future retrospective rock opera” — the year 2049 reflecting on the year 2020. The rock opera is produced by the Virtual Krewe of Vaporware, New Orleans' first "virtual Mardi Gras krewe," which describes itself as "a collective of artists, hackers, breakers, thinkers, and coders from New Orleans and the internet,” according to its website. Both the Piazza and Gallier Hall shows will be accompanied by music. Expanding to New Orleans Jazz Museum in the French Quarter, LUNA Fête will showcase “Sound Collage,” Dec. 5-7, that will feature live music, projection mapping, an arts market and illuminated installations. “We’re so excited to partner with the Arts Council on extending LUNA Fête into the French Quarter,” said New Orleans Jazz Museum Director Greg Lambousy. “Our mission is to showcase New Orleans as a city that values art in everything," said the Arts Council’s Schmalbach.